Author Betsy Grant of Wisconsin Dells, Wisconsin is pleased to announce that the governor of Massachusetts, Charlie Baker, has declared July 28th, 2016 to be VERNON E GRANT DAY, to honor Cambridge, MA native Vernon E Grant for his contributions to the world of cartooning. Betsy Grant will be going to the American Legion State Convention at the Madison Marriott West in Middleton WI from July 14th to the 16th to offer and sign two recently published books of cartoons of her late husband, Vernon E Grant, the “Adventures of Point-Man Palmer in Vietnam” and “STAND-BY ONE!” (Little Creek Press, 2014 and 2015). 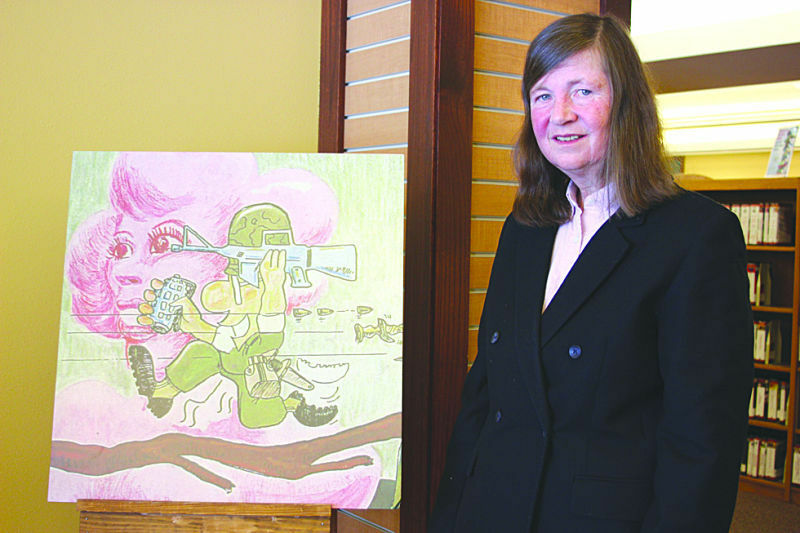 Vernon was a U.S. Army Captain and lifelong cartoonist. He created two Point-Man Palmer graphic novels, a book of Viet Nam War cartoons, STAND-BY ONE!, and the science fiction series, The Love Rangers. He was the first American cartoonist to introduce Kaiju (monsters) to America, and to use the manga style of cartooning he learned living in Japan. July 23rd marks the 10th anniversary of Vernon’s passing. To mark this date, Betsy Grant will be making three appearances in July to talk about Vernon E Grant and his legacy. The American Legion Convention is the first of these three appearances. Betsy will then have a table from July 23rd through the 26th at the National Convention of the VFW (Veterans of Foreign Wars) in Charlotte, North Carolina. On July 28th, Betsy Grant will appear at a reception in in Cambridge, MA at the Cambridge Public Library at 449 Broadway, to celebrate VERNON E. GRANT DAY. The reception is sponsored by the Cambridge African American Heritage Alliance (CAAHA) and will include presentations of the Governor’s proclamation, as well as a proclamation by the City of Cambridge also celebrating VERNON E. GRANT DAY. The program will also include a talk by Betsy Grant as well as others to discuss Vernon’s life and art. Please view Betsy’s most recent interview for more information about Vernon Grant and the books. Here is Betsy’s latest interview, done July 14th by NBC 15 news in Madison, WI. This entry was posted in Events, Local Events and tagged Betsy Grant, Cambridge Public Library, Free Event, VERNON E GRANT by Roho. Bookmark the permalink.